Kristen Treuting was born and raised in rural New Jersey where she developed her love of gardening and all living things from her father. Her mother taught her a sense of seeing things in creative ways and provided her with art history knowledge. Kristen enjoyed art classes throughout high school and college, eventually earning a degree in art education. She has dabbled in painting, photography, fiber arts, book arts and paper marbling. 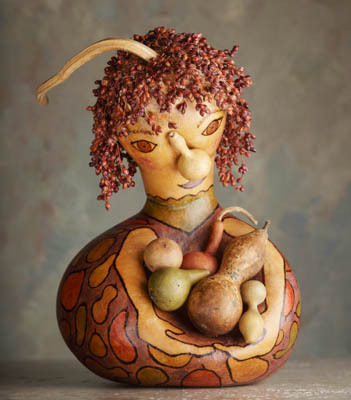 Many of the gourds she uses for her art she grows herself and finds the entire process, from planting to harvesting and from cleaning to creating each into a new art form, so amazing and gratifying. She finds the sense of ‘flow’ in the shapes and forms of the gourds themselves. The theme of water and flow naturally show themselves in her work, as do leaves, trees, animals and flowers. 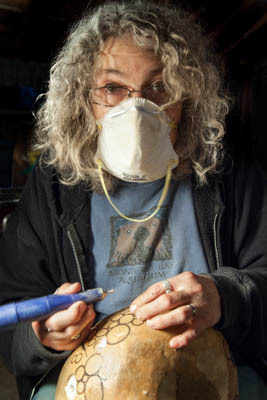 She uses a variety of techniques when making her gourd creations to include wood burning, carving, staining, weaving, marbling and often embellishes them with natural objects and fibers. Kristen has shown her work at numerous stores and art centers throughout the Twin Cities, and in art festivals such as Powderhorn, Art at St. Kate’s and the Woman’s Art Festival. Read more about Kristen’s process on NorthernDipper.com.